Top quality soils and soil enhancers at competitive prices. Gardenscape has potting soils, topsoil, Michigan peat, and mushroom compost. Gardenscape soils and soil enhancers are screened and must pass stringent checkpoints prior to packaging. Top Soil – Our topsoil is a mixture of soil, composted cow manure, sand and other ingredients. Used as a top dressing, and patching lawns with bare spots. Our topsoil is ideal for filling holes and leveling low areas. Can be used as a soil replacement to build landscape beds and gardens. Comes in 40# bags. Peat Humus - Fully decomposed forest fibers, made from organic plant and soil matter, loosens heavy soils and improves moisture extension. Comes in 40# bags. Michigan Peat – Michigan peat is a highly organic natural peat dug from central Michigan bogs. It is 100% soil based, and is superior to other soils because of its longer life and fibrous quality, which assists drainage. Comes in 40# bags. Composted Cow Manure – Our composted cow manure is a natural fertilizer collected and composted. Mixed 1.1.1. compared to most of the competition mixed at .5.5.5 makes our composted cow manure an excellent source of natural fertilizer. Once composted it is bagged in 40# bags at our bagging facilities. Potting Soil – Our potting soil is a special potting blend for indoor houseplants and outdoor planters. Gardenscape potting soil is a perfect blend of peat humus, sphagnum peat moss, vermiculite, perlite, dolomitic limestone and other composted materials. It provides fresh nutrients and assists with drainage to avoid root rot. 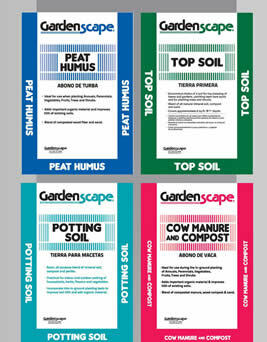 Our potting soil spreads easily and loosely to promote plant development and growth. Comes in 8#, 20#, and 40# bags. Mushroom Compost – Gardenscape mushroom compost is collected from mushroom farms. Mushroom compost is a mixture of rich, highly selected ingredients used to grow premium mushroom crops. Once the mushroom crop is harvested the compost is removed but it is still rich enough to be used by gardeners. Mushroom compost can supply nutrients and increase the water holding capacity of the soil. It is best to mix with regular garden soil because the strength of the concentrated nutrients could harm young plants, seedlings and seeds. Mushroom compost is available in 40# bags. Professional Mixes – Our professional mix is blended with the ingredients most desired by professionals for superior growing results. Ingredients include, peat humus, perlite, vermiculite, sphagnum peat moss, and dolomitic limestone, for drainage and soil acid absorption. Gardenscape professional mix is great for potting bulbs and root cuttings. Comes in 8qt, 16qt, and 2cf bags and our compressed professional mix comes in 3.8cf bags. Sphagnum Peat Moss - 100% pure Canadian sphagnum peat moss. A natural organic soil conditioner with a unique structure that provides a good balance of air and water around plant roots for healthy plant growth. Comes in 2.2cf, 3.8cf and 55cf. Copyright © 2011 Gardenscape Inc.